This interactive site, created by Franziska Lys with technical and creative help from the Multimedia Learning Center and the Department of German, uses political and cultural change as a vehicle for language and culture learning. Professor Lys traveled to Neubrandenburg, Germany in 1991 (and again in 2002) with NU faculty and MMLC creative staff to conduct video interviews exploring the “die Wende” (the turn in the road, a phrase used to refer to the re-unification of Germany) through the eyes of residents in a small East German village north of Berlin, near the Poland border. 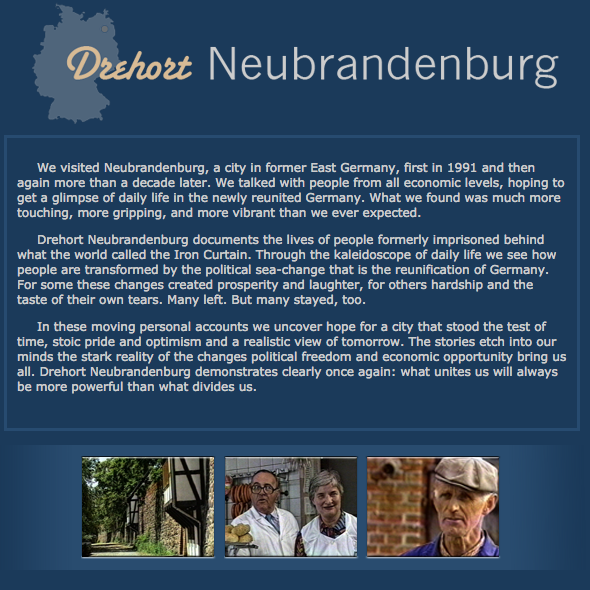 The interactive site is rooted in these interviews and is used in second year German classes. The site has garnered much interest, due to Professor Lys’ novel approach to language comprehension exercises the use of cutting-edge dynamic content delivery systems.